Metro is a design style that was created by Microsoft. The design style’s main objective is to remove any gradients and chrome-like decorations and allow users to interact directly with content. It’s all about focusing on the content and the beauty of simplicity. What Are WordPress Metro Themes? 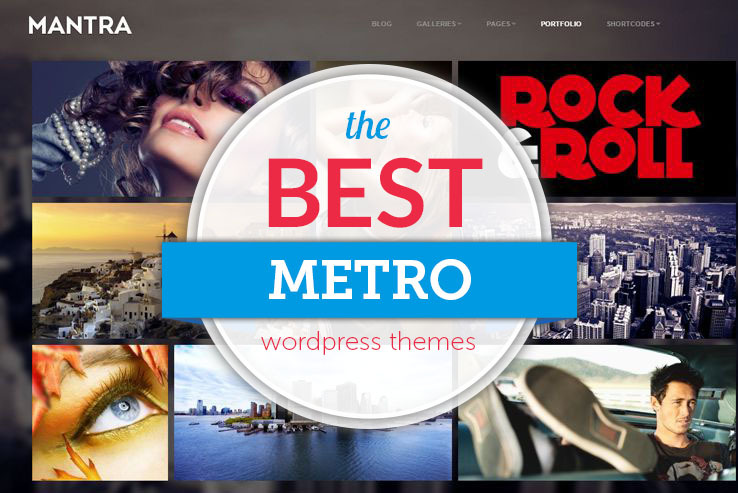 In terms of WordPress themes, all you have to know is that when a theme is called “Metro,” it’s modern and clean. The primary principle you’ll find with Metro WordPress themes is that most of the focus is on typography as opposed to graphics. That’s not to say that you can’t put images and icons on these themes, but clear content is what the designers were going for. As with all clean and modern themes, you’ll notice lots of white space, clean blogging interfaces and interesting typography for grabbing attention and showing that you’re creative without going overboard with things like animations; many flat designs can be considered Metro as well. What’s So Special About a Metro Theme? The best part about a Metro theme is that you can generally take it and make customizations to fit your own branding requirements. Some of the themes could be used for online shoe stores, while the same theme could be implemented by a mommy blog. The only similarity would be that the design is stylish and clean. Since it’s hard to figure out exactly if a theme is considered to be Metro, we did the work for you and located the best solutions on the internet. Keep reading to learn more about the best metro WordPress themes for professionals. 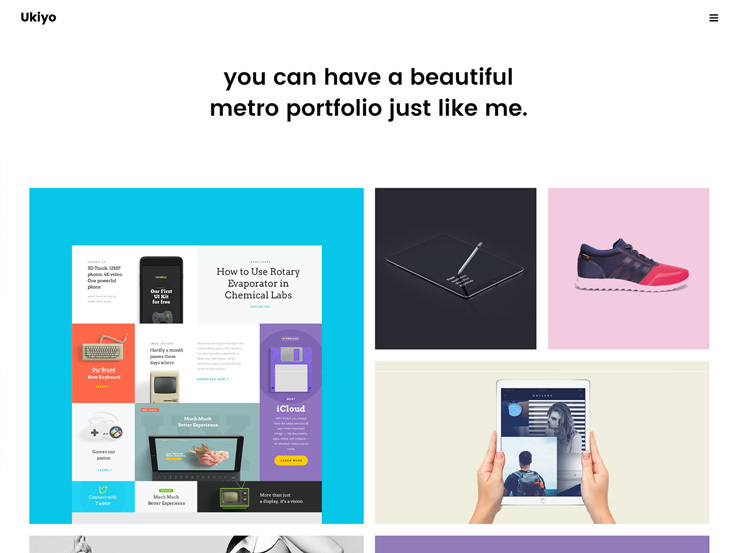 The Next – Easy and Modern theme comes with a live Metro panel for designing the ideal portfolio for your potential clients. The theme has interactive movements and it actually looks similar to the way Windows tiles or the Windows 8 system works. The Freedom splash page is perfect for those who need to grab attention right from the start while the appearance animation is featured throughout the entire website. What’s interesting is that this animation doesn’t seem to slow down the site and it runs smoothly as people scroll down the homepage and move their mouse over elements. The Live Metro Panel theme is completely responsive and looks great even on mobile devices, and it comes with a slide-out mobile menu, which is perfect for saving space and giving people the option to view the menu. The AJAX portfolio runs quickly on your site and it uses various animations and colors to show clients the most relevant content. Several shortcodes are included when you purchase the Live Metro Panel theme. These come in handy if you don’t know how to code simple elements like buttons and columns. Developers like these shortcodes as well because you don’t need to start from scratch. An unlimited amount of page subsections is included while the two menu styles are nice for a bit of branding and making navigation easier. Along with that, the theme includes an unlimited Flickr feed, just in case you have a more image-centric business. Create a resume and profile page for talking about yourself and even send this page to potential employers for easy viewing on mobile devices. A contact page is included and various filters are incorporated in the portfolio to make browsing quick and easy. Along with testimonials and social buttons, the Next WordPress theme is one of our favorites on the list. Check out the Cinergy theme if you’d like a clean and modern theme with search engine optimization included. The fully responsive theme looks great on smaller devices and it actually runs on Bootstrap, so you know you’ve got an effective platform. The theme comes with the Revolution Slider, which is generally sold separately. With this plugin, you can create stunning slider images and include overlaying text and buttons for sending people to other parts of your site. Tons of shortcodes are available and eliminate the need to delve into the source code. This is one of the more professional themes you can find since it has quite a few custom page templates for sharing information about your company. A homepage template allows you to tailor it to your needs and a contact form comes with the theme, which is handy for keeping in touch with your customers. Some of the other page templates include one for a portfolio, your team, and a blog. The team members area is wonderful for sharing images of the people who work for you, while the portfolio has links and thumbnail images of the projects you’ve worked on in the past. The blog is clean and modern and it allows you to share quality content with your readers while also boosting your search engine rankings. Various icons are great for adding visual appeal that highlights your services and the advanced typography and background options come into play when you’re attempting to make your brand look good. What’s cool is that the theme has several stylish portfolio templates so you can choose the one that’s best suited for your business. 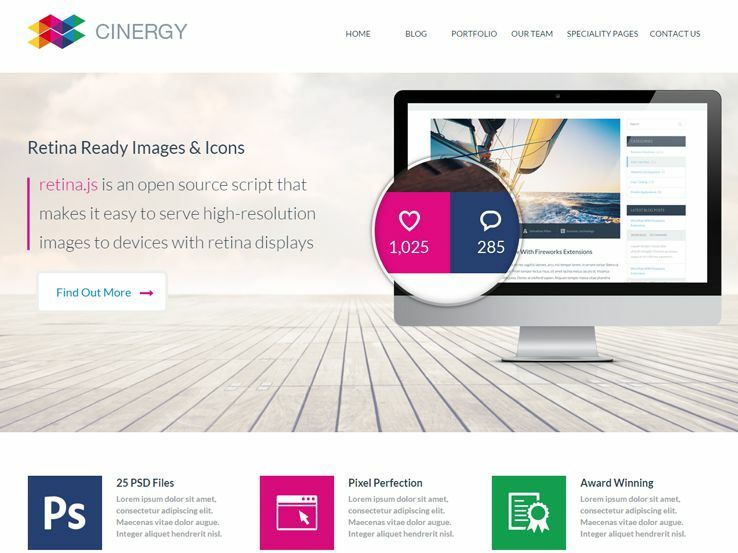 Overall, the Cinergy WordPress theme is one of the more creative themes we’ve seen, so check it out and let us know what you think. 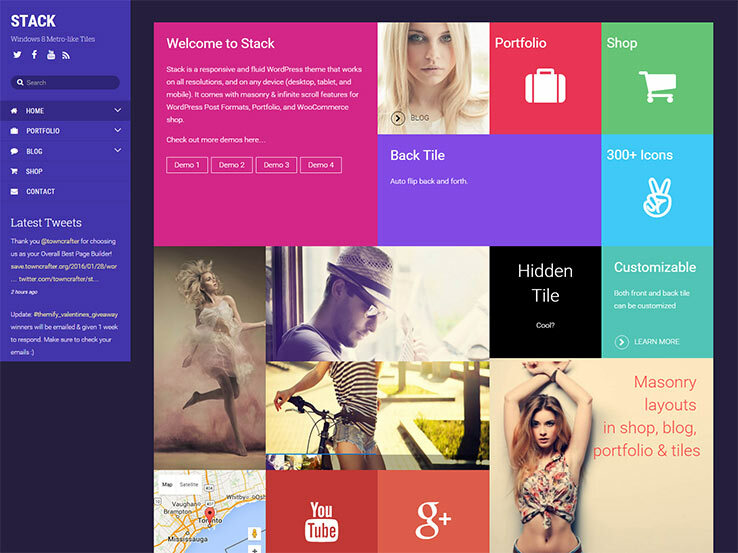 The Stack theme comes from the folks at Themify and it has a design similar to the Microsoft tiles that are popular right now. The responsive and Retina-ready interface looks great when people open it up on mobile devices. In addition to that, a tiles add-on allows you to quickly drag and drop certain tiles throughout your website. These tiles are wonderful for making menus and galleries and they have animations that grab the attention on your website. The post formats are fun to customize since you can implement one post with MP3 audio files and a completely separate one with a nice photo gallery. 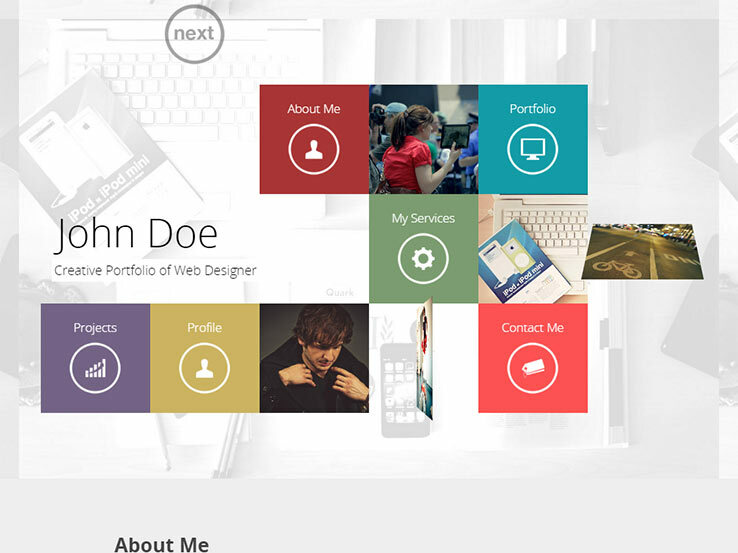 The portfolio has a grid-based masonry layout, along with overlaying text and animations. What’s nice is that the Stack theme provides WooCommerce support in case you’d like to start making money with your website. The infinite scroll feature is popular, considering you can fit just about all the content you need on a single page. The theme includes a drag-and-drop builder for speeding up the design process, while the demo import content means that you’ll rarely have to start your design from scratch. The customization panel has many features and you can insert banner content anywhere on the theme without knowing a thing about coding. Upload your logo image without any problems and consider customizing your fonts with over 600 Google Fonts that are included with the theme. Social icons are a nice touch, while the menu sits to the left of the page for quick navigation throughout your website. The portfolio is truly interesting, because it allows for an unlimited amount of items, and when someone clicks on a project, you can go into detail and include images, text, and various other components that make you and your portfolio look great. Clean and modern is the goal with the Weve WordPress theme and it goes along well with this topic. This is a responsive theme that uses a page builder on the back-end for the ultimate design possibilities. Six color versions and three layout schemes are included to choose from, right from the start. The great theme options panel lets you customize your theme as much as you want. The shortcodes are powerful in terms of eliminating most of the source code you would generally have to work with. Four different sliders are supported, so you won’t have any problem developing a site with a more visual nature. These sliders are wonderful for presenting images in a professional and attractive way and they often have overlaying text and buttons for a clean call-to-action section. The Aqua Page Builder is integrated for drag-and-drop functionality and the localization tools are essential for reaching out to an international audience. All of the browsers on the market work well with the theme, while the widget-ready areas combine nicely with all of the widgets in the theme. Smooth CSS transitions come with the theme, and more advanced users have the ability to change the CSS for more impressive customizations. An interesting part of the theme is that you can create multi-column portfolios, all of which include filter menus. We like this because it increases the number of clients you can bring in, particularly if you focus on a few categories in your work. The fully layered PSDs are bound to help out developers and the dedicated support is better than most other premium plugins you would buy. 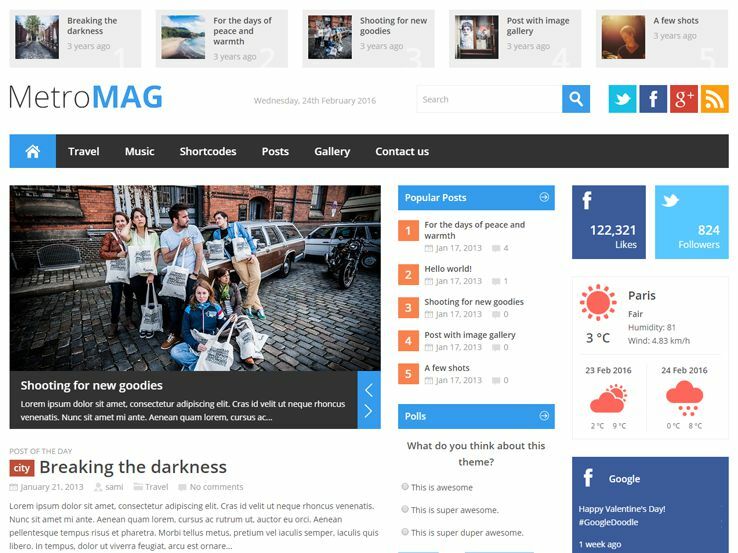 Designed for magazines, news sites, and blogs with a lot of content, the MetroMAG WordPress theme brings a sleek and refreshing design along with a set of powerful features. 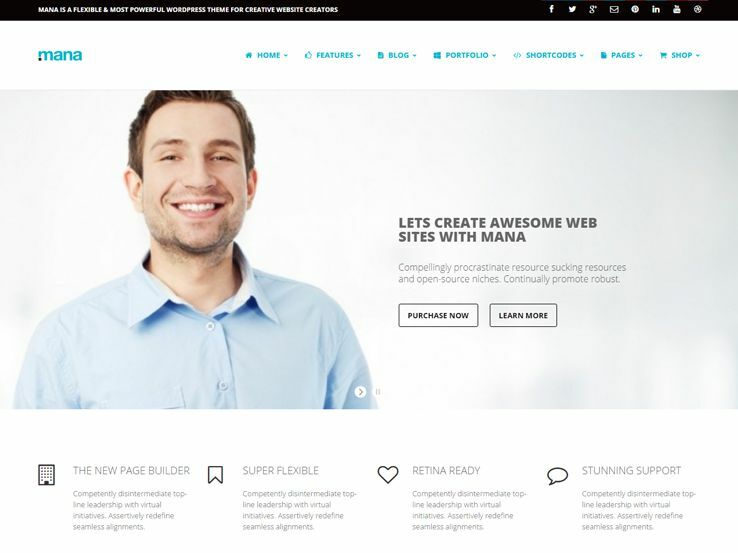 The theme is built using modern web design techniques that ensure you get a flexible and user-friendly interface that works on different devices and screens. Configure the homepage to match your style using the powerful and time-saving theme options panel. You can easily customize colors, typography and other elements as well. 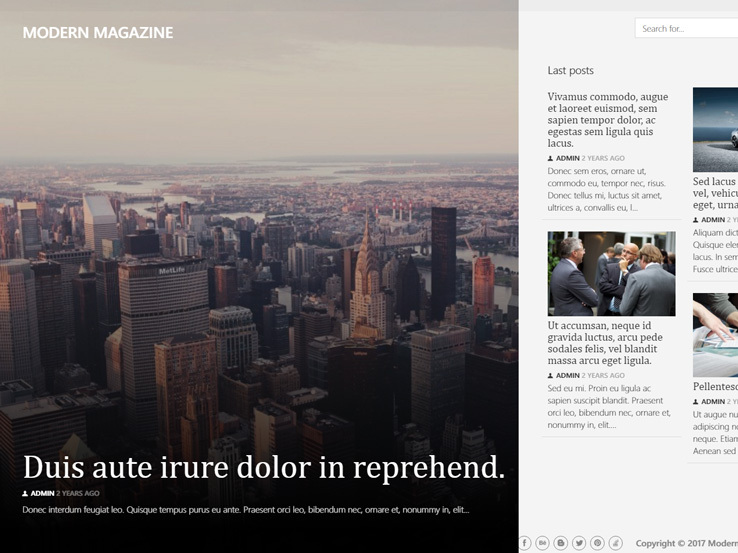 MetroMAG’s other features include 21 custom widgets, page templates, shortcodes, multilingual support, and much more. In the market for a flat news theme? 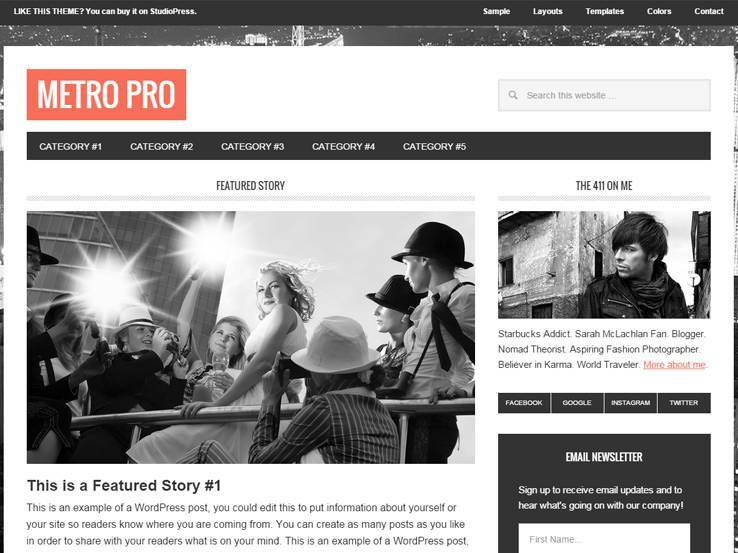 Metro Pro is a stark, black and white template from the good folks over at StudioPress. That means that you get not only one great theme, but also a spectacular Genesis framework. The large background image centers your boxed layout and brings the space to life while WooCommerce integration allows you to turn your website into a complete online store in no time. Metro Pro integrates with all other major plugins and looks great on mobile, too, so check it out. The Metro design style can be an awesome way to showcase your portfolio, and the Rocket Board WordPress theme makes great use of this concept. The template allows you to feature your work using tiles that can have their own specific colors. And besides the portfolio, you can choose to show your latest blog posts on the homepage using the metro style as well. 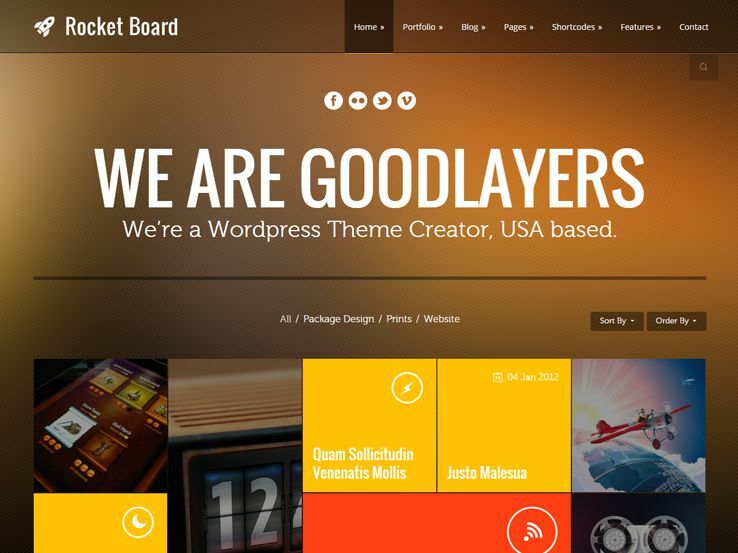 Rocket Board comes with many other features and benefits, including nine predefined background colors, a drag-and-drop page builder, an advanced admin panel to easily control your site’s display options, and custom post types. Perfect for magazine sites that want to provide a newspaper-like user experience, the Modern Magazine WordPress theme brings a stylish and contemporary design complete with lateral scrolling. Since the template is ultra responsive and touch-optimized, your users will enjoy a smooth browsing experience across all devices and screen sizes. 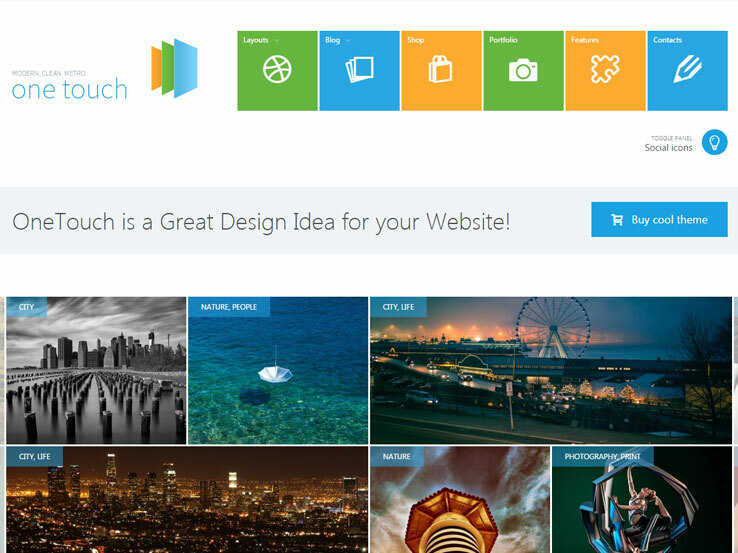 Lots of rich widgets are available for you to easily display different elements on your site. Use the live customizer to style your site with live preview. Moreover, you can easily install the theme’s demo content in one click, and you get access to extensive documentation and free lifetime updates. 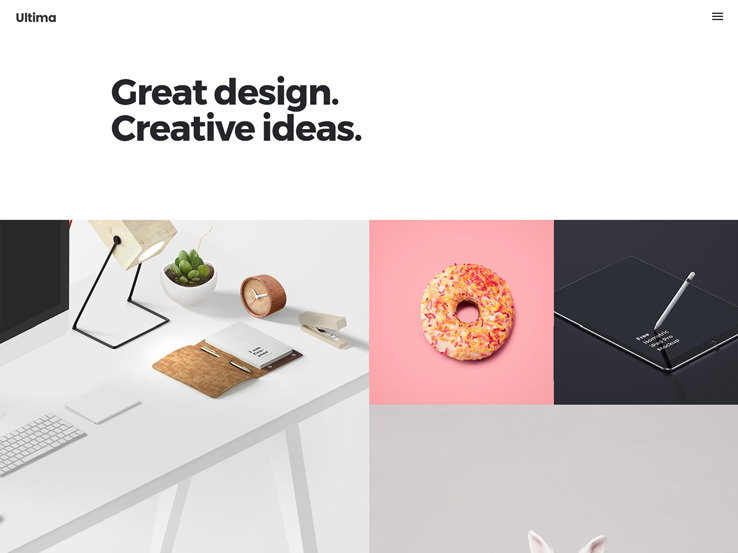 If you’re an agency or a freelancer, you’ll love how the Ukiyo theme presents your portfolio. This modern, fresh template comes with an awesome portfolio module that has a variety of layouts, columns, and hover effects. The theme is highly customizable and includes a powerful admin panel that makes it easy to control every aspect of your site. The responsive and Retina-ready design means your site will look beautiful and work correctly on all devices and screen sizes. You’ll also find a premium slider, a drag-and-drop page builder, customizable header types, shortcodes, and much more. 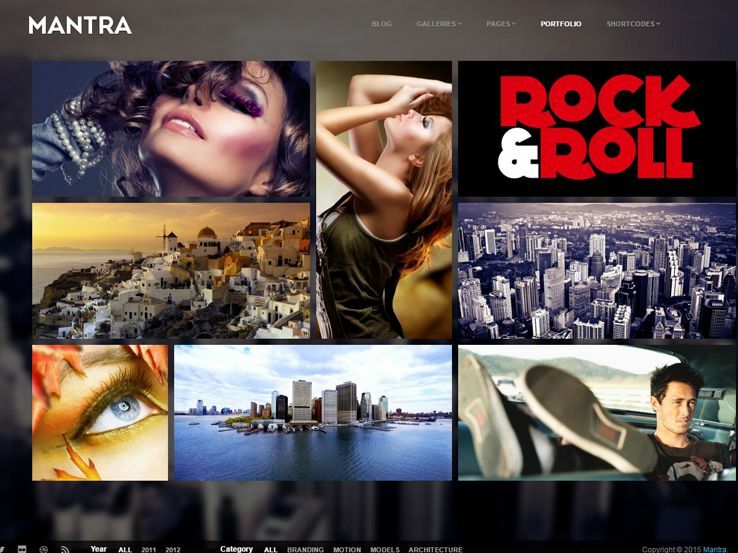 Metrika is a simple, flexible, and modern one-page WordPress theme with great dynamics and a user-friendly back-end. The template features solid and photo backgrounds. It also comes with seven perfectly designed pages that you can use right away. 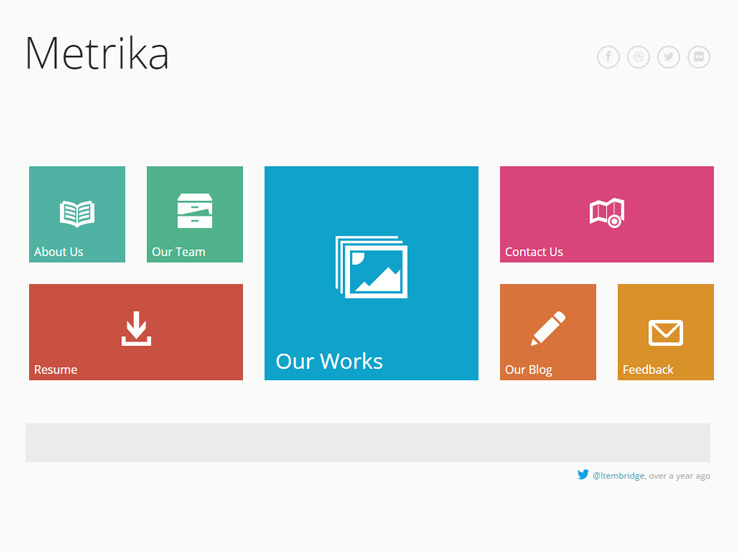 Metrika is easy to set up and highly customizable using the powerful admin panel. Changing things like colors and fonts is easy. Based on the Twitter Bootstrap framework, the template is also 100% responsive, ready for Retina displays, and compatible with all major browsers. Are you looking for a fresh and modern website for business or personal use? If yes, then give the Ultima WordPress theme a try. This template offers an innovative design and plenty of powerful options such as 24 distinct homepage styles, a large collection of inner page layouts, custom shortcodes, four header types, and much more. Whether you possess coding skills or not, building your site will be easy and quick thanks to the drag-and-drop page builder, extensive documentation, and the friendly and professional support available. You’ll also get many other features and benefits including eCommerce capability, social media integration, and the ability to translate your site into other languages. 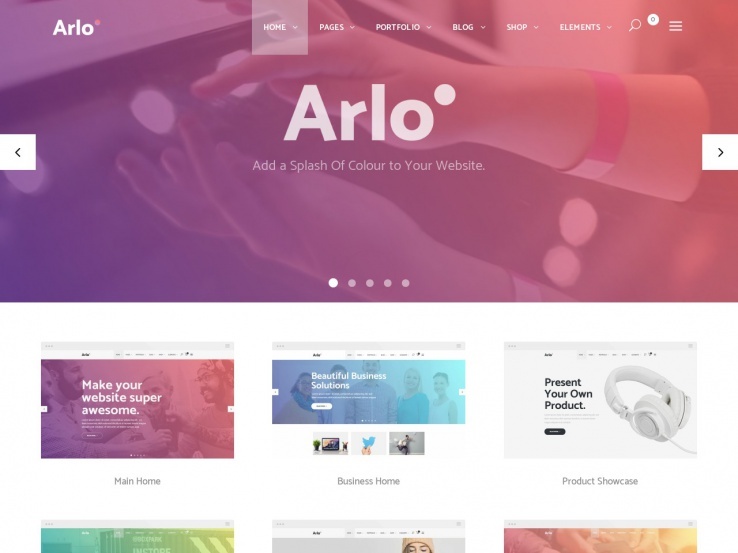 The Arlo WordPress theme offers a clean, sleek, and creative option for tech and digital businesses. Choose from 12 pixel-perfect pre-made homepages that are easy to customize, several portfolio styles, custom shortcodes, blog layouts, and more. The back-end is beginner-friendly and no coding knowledge is required. You can set up your whole site in minutes, complete with eCommerce support so you can easily sell your products and services online. In addition, you’ll find helpful support, sliders with overlay effects, social media widgets, and much more. 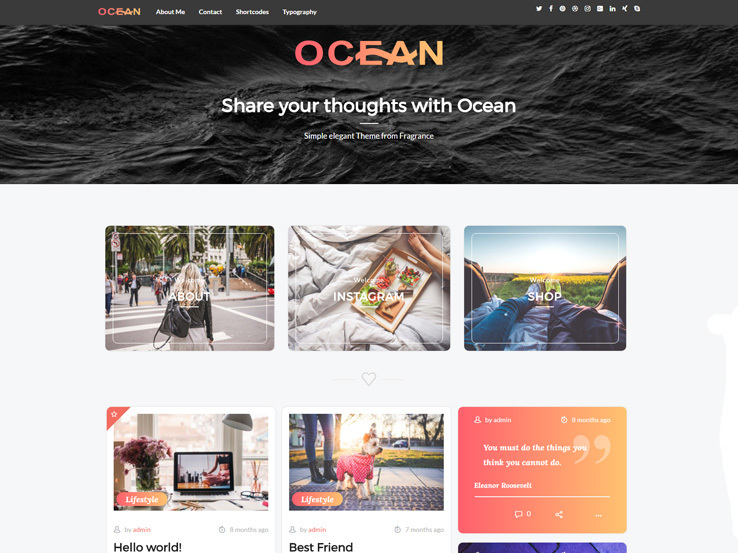 Ocean is a mobile-friendly WordPress theme that suits bloggers looking for a clean and modern website appearance. Built on the Bootstrap framework, the template is user-friendly and works seamlessly on any device and screen size. The Ocean theme is easy to setup and customize, even for those with little coding skills. Adding your logo and changing backgrounds, colors and fonts will be a breeze for you. Also, you’ll get 3 header layouts to choose from, social media integration, custom widgets, regular free updates, and more. 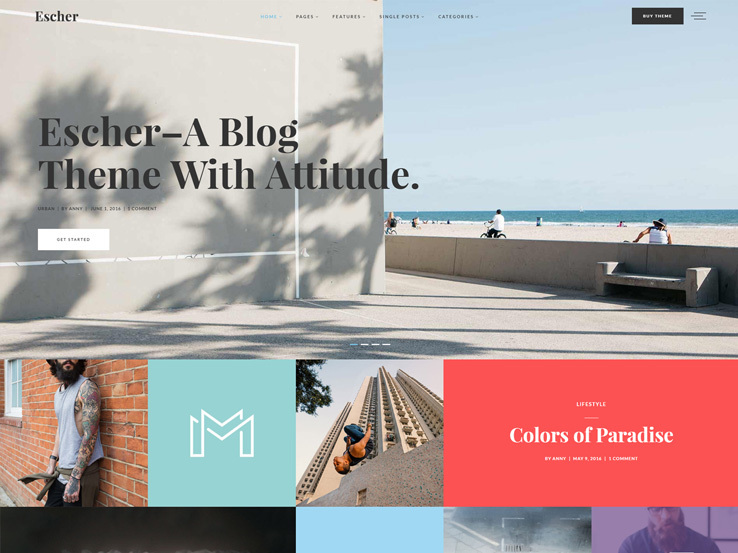 Escher is a sharp, stylish lifestyle blog WordPress theme with plenty of options, stunning animations, and many other features needed to build a successful modern site. You’ll get 7 different homepage styles, an animated blog list that’s sure to impress your visitors, fully customizable post layouts, and social media buttons to easily get your content shared. Moreover, your site will support multi-languages and look sharp on Retina screens and mobile devices. Escher’s other features include shortcode support, infinite scroll functionality, and Google fonts support. Want to showcase your projects to the world in an artistic manner that’s sure to stand out? 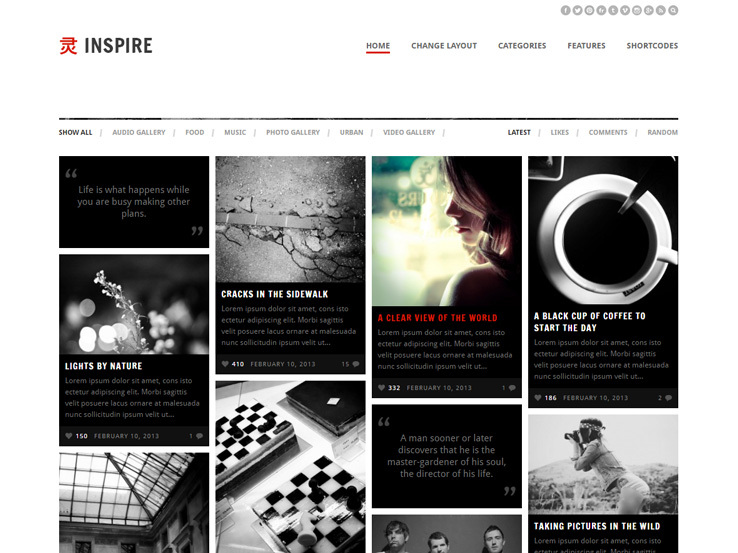 If that’s you, then check out the Inspire WordPress theme. This multipurpose template provides a clean, stylish and modern design with a masonry layout similar to Pinterest. Furthermore, Inspire incorporates AJAX web technologies so your users can enjoy a smooth and seamless browsing experience. The theme is easy to customize, mobile-friendly, and ready to be translated into other languages. You’ll also find 5 different layouts, 5 custom widgets, and lots of shortcodes. 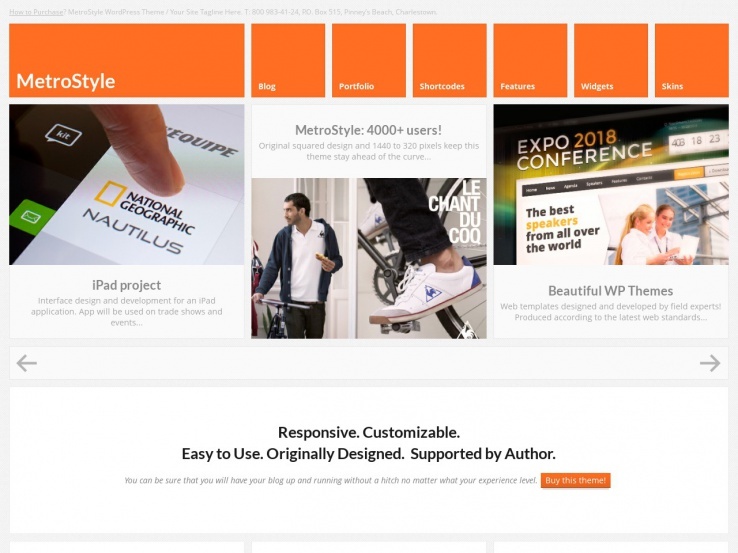 Just like the name suggests, the MetroStyle WordPress theme is inspired by the Metro design style. This clean and flexible template is packed with useful features that can be easily customized to match any business needs. You’ll get a unique scrolling homepage slider that looks attractive, multiple portfolio styles for showcasing your previous projects, unlimited color options, lots of shortcodes to easily insert content to your pages, and two blog layouts so you can share your knowledge and boost your traffic. Whether yours is an entertainment blog or a serious corporate site, a fast and lightweight template is great for your site. Add to that a clean and modern design, useful modules, plus a wide range of customizations and you’ll see why many folks love the One Touch WordPress theme. You’ll find a Metro menu that can be easily customized to your liking, and a Metro news slider with plenty of options. In addition, every content page has the option to easily add your own Metro tiles. Other notable features include unlimited portfolios, pricing tables, Retina support, and more. Mantra is a refreshing Metro style WordPress theme ideal for presenting your work in a stand-out way. Based on the Twitter Bootstrap framework, this template is Retina-ready and fully responsive, meaning your site will look great on mobile phones as well as high-pixel devices. Mantra comes with plenty of useful options. You’ll have unlimited color options, over 40+ fonts to choose from, unlimited portfolios and galleries, and 30+ shortcodes for use in posts and pages. In addition, you’ll have access to custom widgets, Google Map integration, video documentation, and much more. 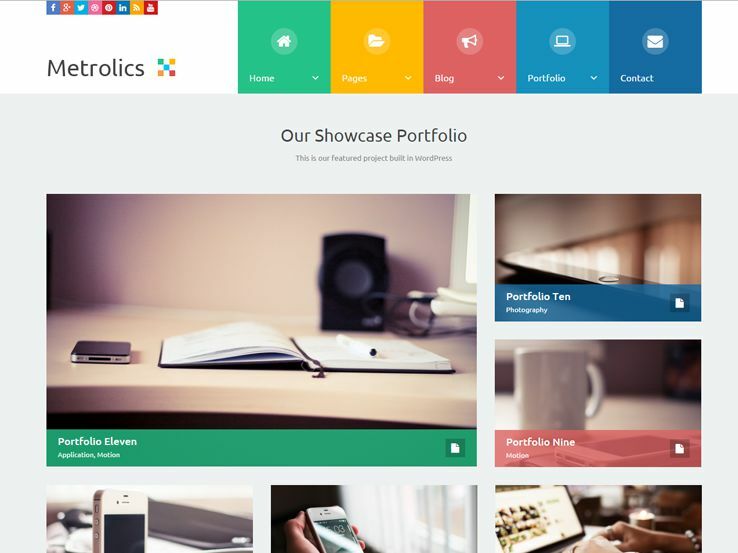 The Metrolics theme features a modern Metro design that’s ideal for personal as well as agency portfolio sites. Thanks to the simple, minimalist approach used, your visitors will be drawn to your content and your site will have a consistent look across all devices. You’ll get plenty of features and options for this theme. The template includes 50 built-in theme patterns, 4 homepage layouts, 5 portfolio layouts and 3 blog layouts to choose from. Also, custom widgets, custom post types, and Google Web Fonts are available. 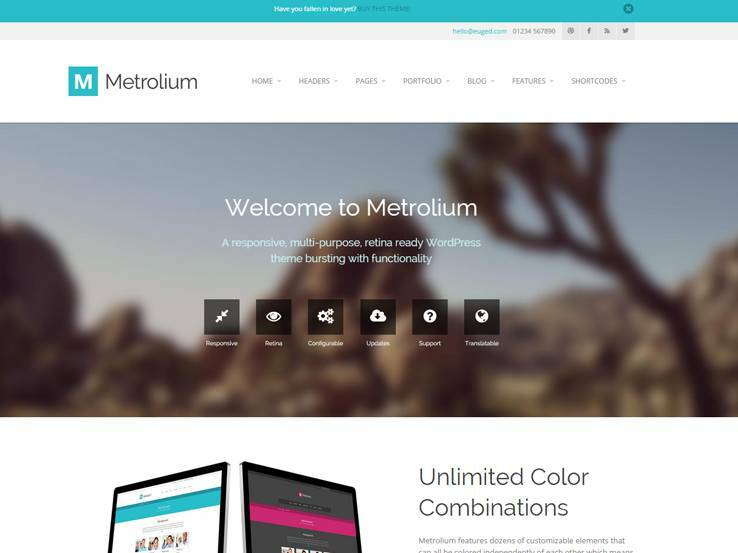 Inspired by the Metro design style, Metrolium is a modern multipurpose theme complete with a responsive layout and Retina support. 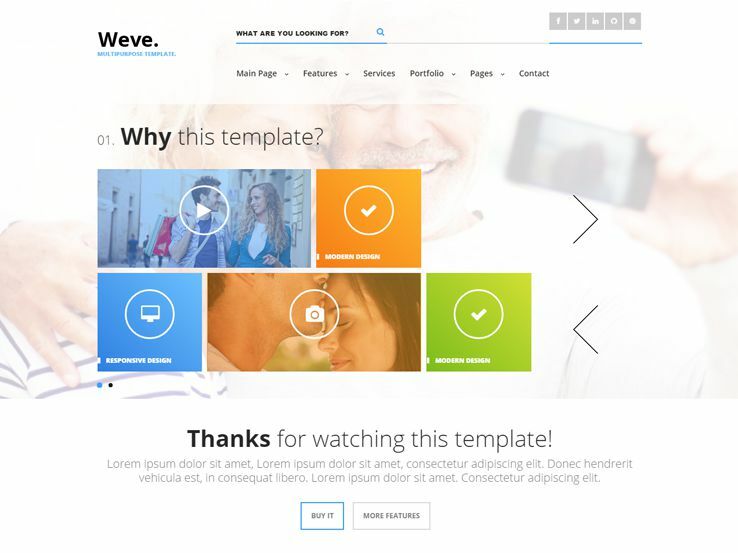 The template comes with three fantastic premium sliders perfect for highlighting your messages, boxed and full-width layouts, multiple blog and header designs, and a real-time WordPress customizer for controlling your site’s appearance with live preview. The sortable portfolio is great for presenting your previous work while custom widgets allow you to enhance the functionality of your website. Also, you’ll find lots of shortcodes as well as pre-defined shortcode-powered page templates to get you started right away. Mana is a flexible and creative WordPress theme that includes a unique, colorful and vibrant Metro blog layout besides the standard blog design. Besides, you’ll find 16 different Metro post styles that are sure to amaze your readers. 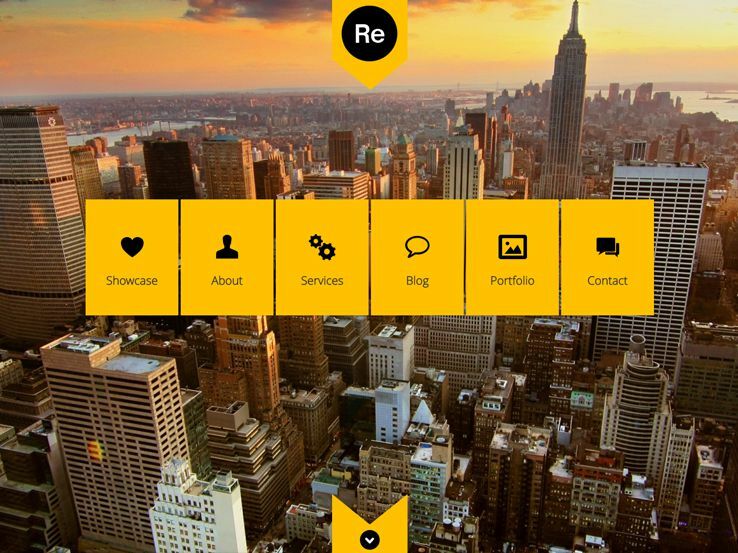 This responsive and Retina-ready template comes with lots of powerful features and options. A drag-and-drop page builder is available so you can quickly create your site without touching any code. You’ll also get various header layouts and menu styles, a page customizer, premium sliders, eCommerce support, and much more. 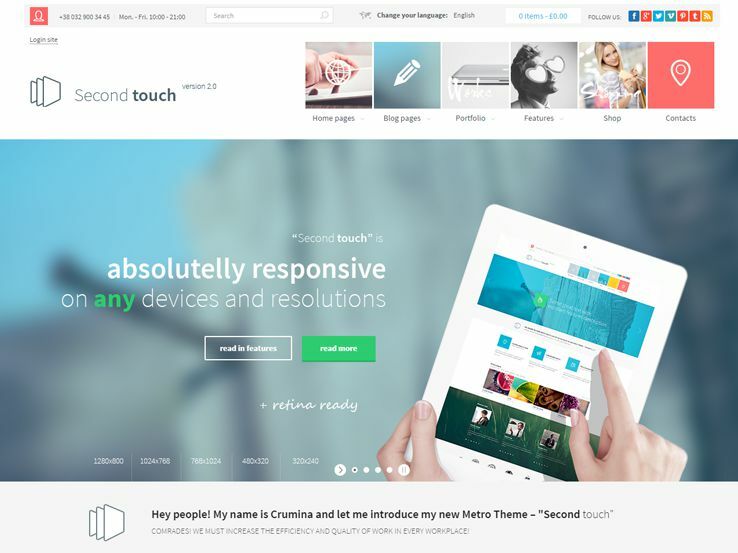 Second Touch is a cool Metro-styled WordPress theme that offers a clean and modern design that will draw your user’s attention right away. The Metro navigation menu looks stunning and has plenty of customization options, which make it perfect for directing your visitors. The layout is fully responsive and Retina-ready, meaning your site will adapt to any device and screen size. Besides the refreshing design, you’ll get powerful features and capabilities such as pre-built layouts, a visual site builder, multilingual support so you can reach people in different languages, eCommerce support, plenty of social media icons, and more. Matrix is a smart, flexible, and well-organized WordPress theme that’s inspired by the Metro design style. This super-fast template comes with beautifully animated tiles that are highly customizable and allow you to present more information on the screen. You’ll even find four different tile layouts to use on your archive pages. The template comes with over 25 shortcodes that can be easily inserted into your pages via the post editor, an advanced admin panel to easily control your site’s appearance, eCommerce support, a custom Twitter widget, and over 10 default social media icons. 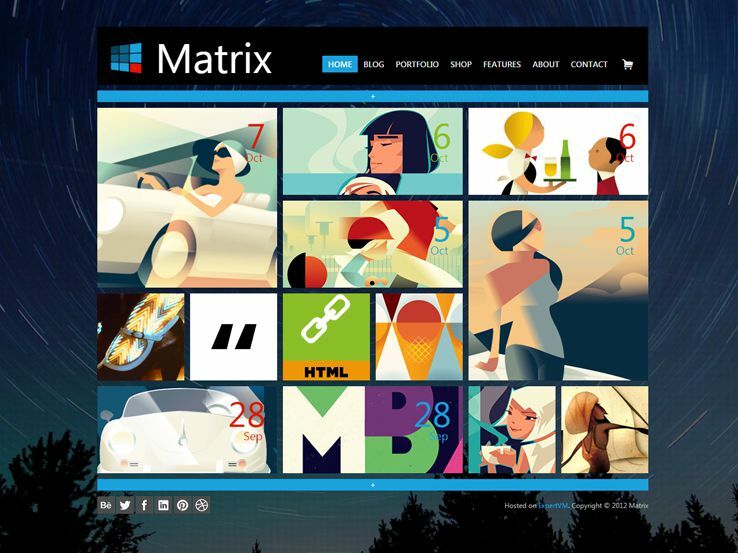 Designed by the folks at Themify, Metro is a delightful and colorful minimalist WordPress theme inspired by Windows 8. The template’s homepage features a beautiful slider along with well-organized tiles that you can use to highlight your recent posts, display social media buttons, Google maps, and more. Also, you’ll find tile custom post types that can be displayed individually, in a group, or in a category using shortcodes. 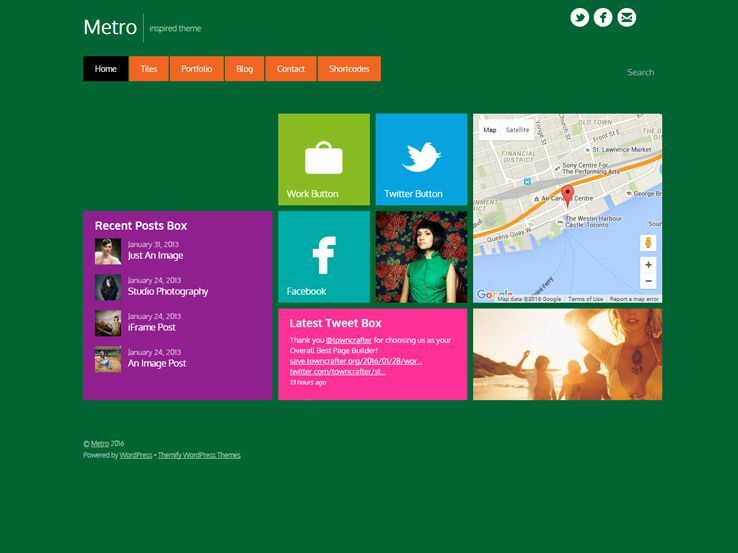 Metro’s other useful features include support for portfolio posts, infinite scroll, and several post colors and skins based on the Windows 8 Metro colors. Renova is a clean and minimalist one-page WordPress theme that incorporates the popular flat design trend. Built using Bootstrap, the template is fully responsive and easy to customize even for beginners. The theme comes with a filterable portfolio, a gallery with lightbox, and YouTube video support as well as a fullscreen background image slideshow. You’ll also find two blog styles to choose from, unlimited color options to suit your style, an AJAX contact form, and demo content to save you time when setting up your site. Other features include an integrated Twitter widget, child theme, and multilingual support. 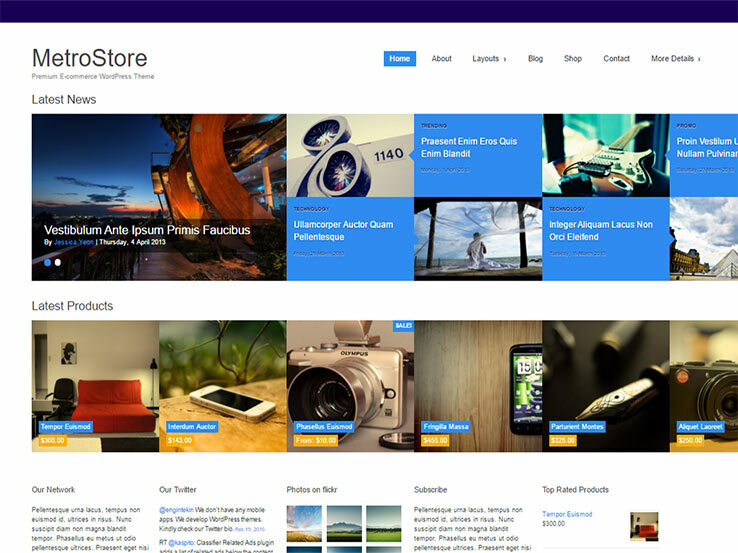 The MetroStore WordPress theme is another theme inspired by the famous Metro design, with flat elements, modern lines, and the ultimate focus on content. The theme is completely responsive, and it works with various third-party plugins such as WooCommerce and Jigoshop. Another plugin that works well with the MetroStore theme is WP Ecommerce, giving you an alternative to the popular WooCommece plugin. Tons of features are packed into this gem, but it all starts with the main sidebar with unique effects. The featured categories are great for people who want to read content on a certain topic, while the headline slider allows you to add overlaying text. We like this slider because it’s easy to set up the images and you can quickly feature events, products, and other things. Users can slide the homepage in a horizontal fashion, which tends to work wonders when they try it out on mobile devices. The products thumbnail flipper is a nice bonus, while the customizable color scheme ensures you have what you need for branding purposes. A comprehensive SEO management system comes along with the theme and threaded WordPress comments help out with creating a community and getting people to talk with each other. Several custom shortcodes are available for quickly building elements that you would generally need to code from scratch. Along with that, you can play around with the social media integration. If you’d like to send people to your Facebook or Twitter pages, it only takes a few buttons to do so. In addition, your blog posts will have sharing buttons so users can share your articles through their favorite social networks. Localization and translation are important as well, considering you’re going to want to connect with people from all over the world, but this requires some translation files. Don’t worry though, because the all of these files are included with the MetroStore WordPress theme, allowing you to translate your website into any language you want.